The heavily armed hero from Halfbrick Studios’s undead-exterminating adventure games Age of Zombies and Monster Dash will return to the iPhone in an all new high-flying adventure, the developer announced on Thursday. Barry Steakfries’s newest adventure is Machine Gun Jetpack. 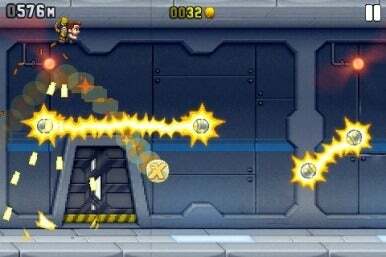 Players will control Barry as he navigates a dangerous laboratory by flying up and over various obstacles, including electricity fields, mobile lasers, and high-powered missiles. He’s aided in this ordeal by his eponymous MGJP, which can shoot enemies and obstacles below him. The game operates as a one-button, Canabalt-style runner, but with flying instead of jumping, and, of course, the addition of Barry’s never-ending stream of ammunition. Players can also collect coins through the various levels, which they can spend on upgrades for Barry, ranging from simple cosmetic additions like a top hat to a more powerful jetpack with bigger and better weapons and abilities. Future upgrades to the app will also include new add-ons as well as upgrades to the app and the in-game’s mod-store. The game will land in the App Store sometime this summer, but pricing and an exact release date have not yet been announced.